The PSLR test is commonly used to test for leg pain and sciatic neuritis. If lifting the straight leg causes leg pain that is then increased with dorsiflexion of the foot (Laseques test) a sciatic neuritis is indicated. However this test may also be used to determine SIJD. With SIJD the PSLR test may actually decrease back pain because the pull on the hamstrings with PSLR will cause the innominate bone to rotate posteriorly (backward). PSLR may also increase pain in the low back on the contra lateral (opposite) side. As the pelvic bone rotates posteriorly on the same side it will carry the sacrum back on the opposite innominate and in effect cause a strain in anterior rotation on that side. If PSLR increases pain on the same side (usually the side of the shorter leg) it is a sign of a secondary slipping at S1 on that side. This is clinically insignificant but is treated by many as a posterior rotation or an upslip. Some chiropractors and PTs mobilize this joint in an attempt to correct a posterior dysfunction or an upslip with the patient side-lying, pulling back on the shoulder and shoving forward and down on the pelvis. The lumbar spine is already unstable because of the loose iliolumbar ligaments and the anterior rotation has overstretched the long posterior ligament. This incorrect procedure could tear the annulus, rupture or extrude the disk, tear or avulse the long posterior ligament and cause permanent chronic low back pain. THE PRIMARY LESION IS AT S3 AND THE ONLY CORRECTION NECESSARY IS OF THE INNOMINATE BONES, BILATERALLY, CEPHALAD AT S1 AND CAUDAD AND MEDIALLY ON THE SACRUM AT S3. As the dysfunction in anterior rotation always causes the legs to get longer, sometimes one more than the other, a manual rotation of the innominate bones on the sacrum will cause each leg to appear to get shorter. This shortening of an apparent long leg is a positive sign that has the advantage of correcting the dysfunction. 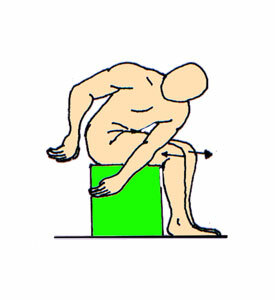 First stand at the foot of the plinth, grasp both ankles holding a thumb immediately caudad to each medial malleolus (ankle bone) and approximate the ankles in the mid-line. Check the leg length. Now it does not matter if the leg length appears to be even, or longer on the more painful side or shorter on the more painful side. Lift either leg to about 45 degrees of PSLR and traction it in the long axis hard enough to lift the buttock on that side. This will cause the PSIS to move caudad on the sacrum. If dysfunction is present, each leg will get shorter with flexion of each innominate on the sacrum. If they are even, one leg will about 1cm shorter after testing. If you pull on the long leg, the legs will probably appear to be of equal length. If you pull on the short leg at about 45 degrees of PSLR, it will appear to get shorter and may appear to be from 1-3 cm shorter than the other. Continue correcting with various described corrections gradually increasing pressure in posterior innominate rotation. Do not stop when the legs appear to be of equal length, but only after the legs no longer appear to get any shorter. The primary points of pain are at the PSIS and PIIS and are extra-articular. If there are no tears in the capsule the injection will become encapsulated and a diagnostic injection may give a false negative result. Murakami et al (J Ortho Science May 2007) in comparing periarticular and intraarticular injections for sacroiliac joint pain injected periarticular lidocaine in 25 consecutive patients with SIJD and found that it was effective in ALL patients. Intraarticular injections were effective in 9 of 25 patients. An additional 16 patients who had no relief from the initial intraarticular injection were ALL relieved from a periarticular injection. Conventional X-rays will not demonstrate this dysfunction thus complicating conventional evaluation and treatment. Referrals to psychiatrists are not helpful and the patient frequently seeks unconventional care. Scanning of the lumbar spine does not usually include the SIJs. When scanning, look for longitudinal tearing in the piriformis muscle at the posterior inferior iliac spine. Arthrography of the SIJ may demonstrate tears in the capsules, especially at or near the PIIS. Roentgenograms taken before (Above) and after (Below) correction of SIJD reveal a dysfunction of the innominate bone cephalad and laterally on the sacrum. 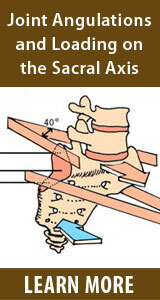 Note movement of the PSISs relative to the sacral foramina. As with the subluxation/dislocation of any joint, the first priority is to reduce the subluxation. If it tends to recur the patient can be taught to self-correct. 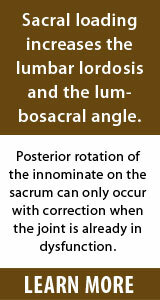 If the lesion is unstable, a lumbosacral support or invasive procedures may be necessary. length difference, polio or serious leg fracture the legs will appear to be of equal length after correction. The corrections should be done every 2-3 hours all day long for at least three days to take the tension off of the tight ligaments and give them an opportunity to recover. After that correct at any sign of recurrence. The corrective procedure is not a vertebral manipulation. No high or low speed manipulative thrust is necessary or indicated. No jerking or popping is necessary or desirable. Correction is achieved by specifically applied traction on the properly positioned joint or by a precise manual rotation of the innominate bones posteriorly on the sacrum. Any of several methods can be used to restore the SIJ to the balanced position: traction at about 45 degrees of PSLR; direct posterior rotation of the innominates on the sacrum; or by using isometric or muscle energy techniques. the event of an injured ankle. When distracting the leg have the patient lift his/her head and tighten the abdominal muscles to enhance the posterior pelvic rotation. First do one side and then the other, checking the leg length at the malleoli and watch for shortening. Do each leg, one at a time 4-5 times on each side, alternating sides each time and checking leg length each time. 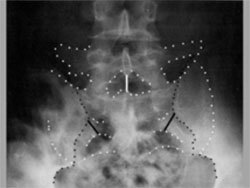 The movement of the PSIS caudad on the sacrum can be palpated. Do not pull on the leg in a direct line with the body. For a correction on the right side, put your left forearm under the right knee and your left hand over the front of the left knee. Push off with your left foot to provide traction, pulling on the leg with the left forearm. The left hand will help to lever the traction. Put just enough force on the right ankle with your right hand to hold the knee in flexion. Apply enough traction to lift the buttock on that side. Do each side 3-4 times, alternating sides each time. 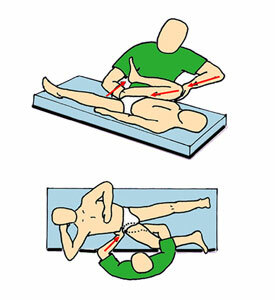 To enhance the correction have the patient lift his/her head to tighten the abdominal muscles. The tight SIJ acts like a stuck drawer and gives just a little bit at a time on each side. The patient can use traction for self-correction by pushing the thigh toward the foot hard enough to lift the buttock on that side. Lifting the head at the same time will enlist the abdominal muscles. Repeat several times on each side alternating sides each time. Do especially when you go to bed a night. 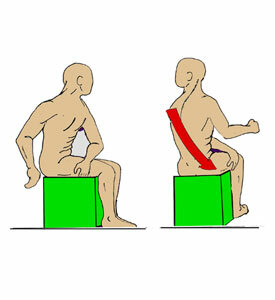 SEATED PATIENT CORRECTION may be done while at a desk or in a car. Push one knee out. Pull the other knee back firmly to pull the pelvis down in back. Tighten your abdominal muscles to pull the pelvis up in front. Do several times on each side alternating each time. Repeat several times daily. Tighten abdominal muscles and push the knee toward the floor. Repeat on the other side. Alternate exercise several times on each side. Repeat correction several times during the day. 1. In the direct correction the leg can be used as a lever and brought to the outside of the body. Knee to axilla. Put one hand under the ischial tuberosity and the other on the top of the patient's knee. While lifting with the lower hand, push downward on the shaft of the femur while also rotating the thigh into flexion. 2. The operator can also directly rotate the pelvis posteriorly by placing one hand under the ischial tuberosity and the other over the posterior aspect of the iliac crest. Rotate firmly pushing with the thenar eminence. The patient can self-correct any time during the day no matter what position he happens to be in at the time. Just by pulling the knee into the axilla or bringing the axilla down to the knee. Stretch firmly several times on each side, alternating sides each time. 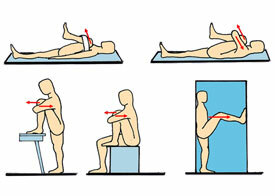 When doing any of these exercises in the supine position be certain to hold your abdominal muscles tight when raising or lowering your leg to prevent anterior rotation of the pelvis. Following the direct correction a stretch of the quadratus lumborum and the hip abductors can be helpful in achieving further correction. Stretch gently as indicated then have patient lift his leg against resistance and then relax. Take up the slack and put traction on the leg as indicated. This may necessitate the aid of an assistant. Follow this with a hard isometric correction. Grasp the knee with both arms, hold firmly and push very hard outward with the knee. Be sure to tighten the abdominal muscles while pushing with the knee to enhance posterior rotation of the pelvis and when lowering your leg. A six-foot luggage belt may be used for resistance or the patient can stand in a door frame and push as shown. This is a very powerful correction. Push hard and hold for several seconds each time. As the core muscles are most active during normal gait when the pelvis is asymmetrical, they are most effectively stretched when the pelvis is asymmetrical. 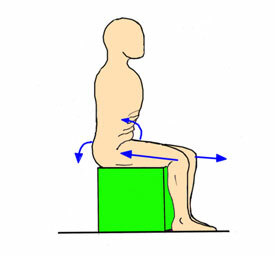 Seated, project one thigh and retract the other to create an asymmetric pelvis. Flex and twist your trunk toward the side of the retracted thigh. This stretches the piriformis, the sacral origin of the gluteus maximus, the quadratus lumborum, the multifidus, the abdominal obliques, the latissimus dorsi and others. Repeat toward the other side. ALWAYS DO CORRECTIVE EXERCISES BEFORE AND AFTER THESE STRETCHES. In order to strengthen the same muscle groups, retract your right thigh and project your left. Twist trunk to the left and grasp the right leg with the left hand. Now extend and rotate the trunk to the left while projecting the right thigh and retracting the left. Provide resistance to the trunk rotation with the left hand. Repeat on other side. Strengthening the rectus abdominis and the abdominal oblique musculature is necessary to help maintain posterior pelvic rotation throughout the day. This exercise is done on the symmetrical pelvis. Place both hands on the same knee, tighten your abs and pinch your buttocks tightly together. Push down hard on that knee for several seconds. Repeat on the other side. Do five times on each side. Seated, simply tighten your abs and glutes, hold tight, lean forward and rise to standing, slowly. Then, still holding your abs and glutes tightly, sit slowly. Repeat ten times. Always tighten your abdominal muscles when standing and sitting. Correct the joint, instruct patient in self-correction and tell him to do the corrective exercises every two to three hours all day long for the next three days at least in order to keep the tension off of the affected ligaments and allow them to recover. On the second day have the patient demonstrate the corrective exercises to you. They will usually be making errors in technique that will preclude a good result and must be re-instructed. If the patient is doing the exercises properly he/she should be told to only return if the pain continues over 10 days. If the pain still recurs after ten days the patient should be put into a lumbosacral support. This support is to be put on when lying down on it and after making a correction. If progress continues with the support the patient can wean himself as indicated. If the dysfunction is still unstable after one month, proliferant injections are indicated into the long and short posterior sacroiliac ligaments. These are the only ligaments so affected. • Do not stretch a tight psoas. Correction will restore normal tension in the psoas. 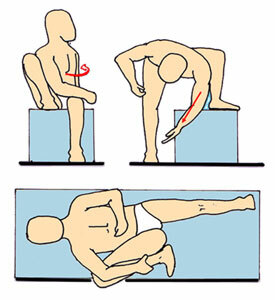 • No double or single straight leg raising. • No sit-ups with the legs out straight. • Never correct into pain. If what you are doing causes pain use a different correction. Hip fractures or hip replacements are not contra indications. Just change to a direct correction by grasping the pelvis directly without using the leg as a lever. • Never prolo the iliolumbar ligaments until the SIJ is corrected and stable. This may preclude the possibility of achieving correction. • Never correct for a posterior dysfunction or an upslip. This correction is unsafe and potentially harmful. 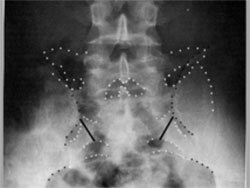 Periarticular injections of local anesthetic and steroid to the area of the posterior inferior Iliac spine and the posterior superior iliac spine to relieve acute pain and inflammation. Proliferant injections to the long and short posterior sacroiliac ligament to stabilize the joint. Do not proliferate any other ligaments until the joint is stable or you might tighten the joint in the uncorrected position and preclude the possibility of correction. Always proliferate with the SIJ in the corrected position of posterior innominate rotation. There may be some value in proliferating the long and short posterior sacroiliac ligaments in the early stages of low back pain. This might strengthen those ligaments to limit collagen failure, help to prevent recurrence of dysfunction and preserve the system. If ligamentous balance is not maintained the collagen may still fail in the long posterior sacroiliac ligament even if it has been proliferated. 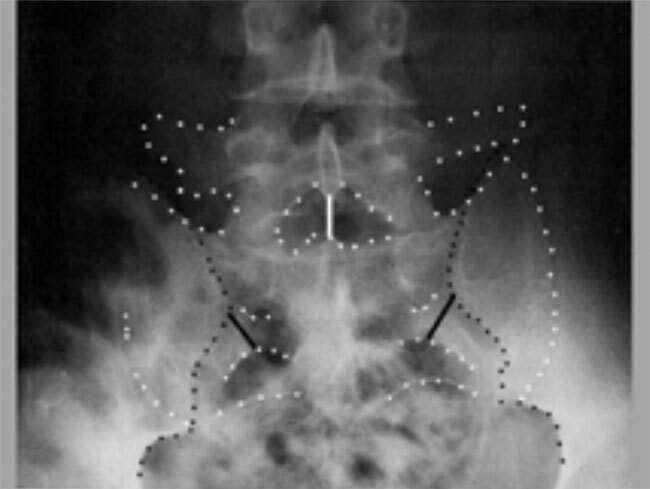 Stability of the lower lumbar vertebra is restored with correction and stabilization of the sacroiliac joint. If after the sacroiliac joints are stabilized in the balanced position the iliolumbar ligaments may be proliferated if they are still unstable. In the patient with multiple fusions and a failed back, in the likely event of an unstable SIJ, it is probably critical to preserve function with ligamentous repair rather than stabilize. The importance of these joint to absorb, modify and redirect the various forces that occur during normal gait can not be overstated. Excess rigidity will predispose to systems failures. 2	The ligament is shredded or otherwise traumatized. 3. The ligament is not in a corrected and shortened position when injected. 4. If the ligament is avulsed from its attachment to the PSIS. 5. If the patient has a protruding abdomen and refuses to lose weight. If it is not possible to stabilize the joint with proliferant then you might consider ligamentous repair of the long posterior SI ligament. It is superficial and quite accessible. It may be feasible to transfer tendon from the adjacent sacrospinalis muscle to the PSIS and marry it with proliferant to the long posterior SI ligament. Always operate with the joint in the corrected position. In the event of severe joint injury and gross ligamentous instability surgical fixation may be necessary. Fixate in the corrected position. Caution the patient as to limiting activities that create or increase the asymmetric pelvis. If these activities are blocked posteriorly they will manifest anteriorly and destabilize the symphysis. After fixation, if the patient uses a non-weight bearing gait, the ipsilateral leg hanging down from the innominate bone will cause a force in anterior rotation on the pelvis and might cause a non-union to occur. An epidural anesthetic may relieve the pain of SIJD because of the lumbar innervation of the SIJs, however this should not be interpreted as relief of a referred pain of lumbar origin. It is more effective to treat locally to relieve pain and inflammation. If correcting the SIJ does not relieve the pain or if the patient has an SIJ fixation in the uncorrected position, consider releasing only the secondary origin of the piriformis from the roof of the greater sciatic notch to preserve function in that muscle. Cutting the tendon of the piriformis muscle decreases sacral stability during ambulation. When ordering therapy please specify the DonTigny Method. Many therapists are still using methods based on standard AAOS testing or are using traditional side-lying manipulations. If this program has helped you and you would like to make a small donation to help keep it available on the internet, please send it to Richard DonTigny, PT. Thank you. 18 page PDF file (1.42MB) - digital download. Complete corrective exercise program with precise instructions for self-correction. AFTER CHECKOUT IS COMPLETE YOU MUST CLICK "Return to www.thelowback.com" on the Paypal payment confirmation page to be taken to the download page. Please email me if you have any issues. This work is the result of 38 years of clinical practice, about 8000 cases of SIJD and 40 years of research. This program is offered as a public service.